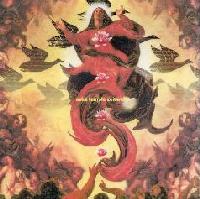 Aska Temple - "St. Maria, She Extends Her Hands" / "Omega Point Live" / "Zeitwelle" / "Hosanna"
Aska Temple is the brainchild of prolific Japanese multi-instrumentalist and composer Jöhn Übel. Inspired by German avant rock and electronic music of the 70’s, especially, as his name would suggest, Ash Ra Tempel, Übel stretches out and explores realms both near and far in the ambient/avant-garde universe. Hosanna, as intimated by its title, is the most spiritual of the four releases reviewed here. Although all instrumental (as all four releases are), there is certainly a “heavenly” feel about it, and reminded me a little of some of the beautiful work by Popul Vuh. Both the 20+ minute compositions on the disc also bear spiritual titles. Corridor (at HASE Temple) is a blending of piano and swirling, airy, spacious synth sounds (though it’s all played on synthesizer). It borders on new age, but avoids that tag by being just a little bit more on the experimental side. While a pleasant listen, it doesn’t really go anywhere, and tends to fall more into an ambient haze that fills the background of the listening experience. HOSANNA (for Jesus Christ) is similar in sound (though a little less airy, and more celebratory, befitting its title. Where it does differ is that this piece does take the listener on more of an active journey as deep, church organ-like sounds enter the mix and ultimately, yawning, spacey, synthesized choirs, giving the whole affair a genuinely symphonic feel. The album was an enjoyable listen, but the next three reviewed here I felt had a lot more exciting things to offer. Zeitwelle (German for “Time Wave”) again consists of two lengthy excursions, both in the 20+ minute ranges. The title track begins with swirling waves of electronics, and is quickly joined by freaky, heavily delayed and processed guitar-work, reminiscent of Manuel Göttsching’s Invention’s for Electric Guitar. But this piece moves slowly and dramatically into more avant-extremes and almost frightening psychedelic territory, as the guitar cries and wails over an intensely throbbing bassline, before drifting at last into more twirling eddies of electronic sound with distorted guitar, eventually all dissolving into a riveting industrial noise finale. Quite the journey! Directly contrasting this is the second piece on the album, the beautiful and spacey Asuka, Lotus. Übel achieves the spaciousness and serenity of a Japanese Zen garden, with high, swirling synth passages flowing over deeper pulsations of melodic synth waves. Unlike Zeitwelle, Asuka, Lotus doesn’t really go anywhere musically, but I don’t mean that in a bad sense. Like Corridor (at HASE Temple) in the previous review, this one is ambient music by definition, creating a beautiful moment and staying within it for the duration of the piece. But once again, Übel plays it just enough off the edge to keep it from sliding into New Age mush. Omega Point Live is a double live recording consisting of just one amazing 50-minute long musical journey and a second 37-minute long voyage. These are some of Aska Temple’s most cosmic explorations. Jöhn Übel plays guitar and synthesizer, joined on the lengthy Omega Point Part 1 by synth player Gonzo Murakami, bassist Akibiko Higashiuchihara, and drummer Naomi Noguchi for a fuller, yet more experimental experience than can be heard on his studio albums. Deep space synths swoosh, swirl and gurgle through an understated, free rhythm section for over 15-minutes of space voyaging before an icy, sharp pulsing sequence enters, stabbing through stately organ chords. Übel takes it to extremes with his insane guitar soloing, again reminiscent of Manuel Göttsching’s style, especially from the freakier, early Ash Ra Tempel albums. This goes on for another 20-minutes or so till it dissolves into a churning, rumbling maelstrom that begins a slow descent into quieter, deeply cosmic space realms. 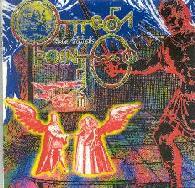 Omega Point Part 2 forgoes the drums, and Übel plays guitar synthesizer (instead of both guitar and synthesizer). The rest of the line up remains intact as the band explores darker, more menacing sounds. Again, the Klaus Schultze influence is strong here, with deep space washes of synth and subtle sequences, all given a unique turn however with Übel’s guitar synth. This one goes super cosmic, with all sorts of bubbling, shrieking, moaning, and whispering electronic sounds and ominous bass, throbbing sequences fading in and out, all swirling deliriously at a strange angle to the rest of the universe. This was definitely my favorite of the four releases reviewed here. St. Maria, She Extends Her Hands is the latest studio work from Aska Temple. While retaining the spaced out electronics of his previous works, this one delves deeper into both classical and jazz realms. At 21-minutes in length, Beyond the Blue Sky is an epic voyage on high, that combines peaceful and melodic piano with a quick, yet soothingly hypnotic sequence. As the piece progresses, darker shades of organ and synth swell in and out and it all reminded me of some of the early Klaus Schultze recordings, especially Cyborg and Time Wind. One can certainly hear the progression from a peaceful blue sky, through stormier higher realms, finally leading to a glorious cosmic finale. Fantastic stuff! 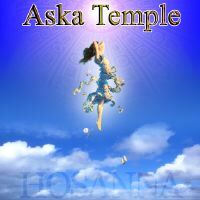 The relatively shorter piece, Pray (clocking in at only 11-minutes-the shortest thing I’ve heard from Aska Temple! 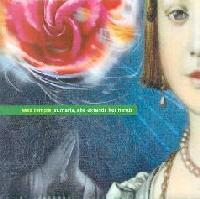 ), is purely piano, an avant-garde classical piece. The title track kicks in with another hyper sequence, but also introduces the exploratory drumming of Yuusuke Mukae. Mukae’s style definitely adds a free-jazz feel to the piece, bearing a resemblence to the complex, asymmetrical styles of drummers like Sunny Murray and latter day Coltrane collaborator Rashied Ali. It certainly helps Übel’s own contribution to the piece, because, while interesting, it doesn’t tend to go a lot of places till the last quarter of its 20-minute length. But thanks to Mukae’s intricate percussion, the piece does have its twists and turns along the way. The CD’s all come packaged in gloriously colorful, psychedelic artwork. The production is not always top notch, but it’s never lo-fi, and all of Jöhn Übel’s playing, regardless of which instrument he’s utilizing, is obviously done with a great deal of passion, something that comes through on every single piece I heard here. Email Jöhn Übel at: johnubel@mqc.biglobe.ne.jp. Contact via snail mail c/o Nicht Records; 198-2 Abeyama; Asuka-Village; Takaichi-Gun; Nara Pref. ; 634-0134; Japan.